T is a connected graph with nodes connected by n-1 edges. Each node has a distinct ID number from 1 to n, and each node ID i has a value, wi. 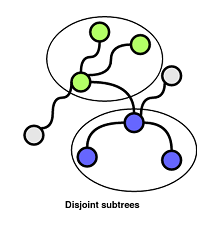 Sum of a subtree is the sum of the wi values for each node i belonging to the subtree. 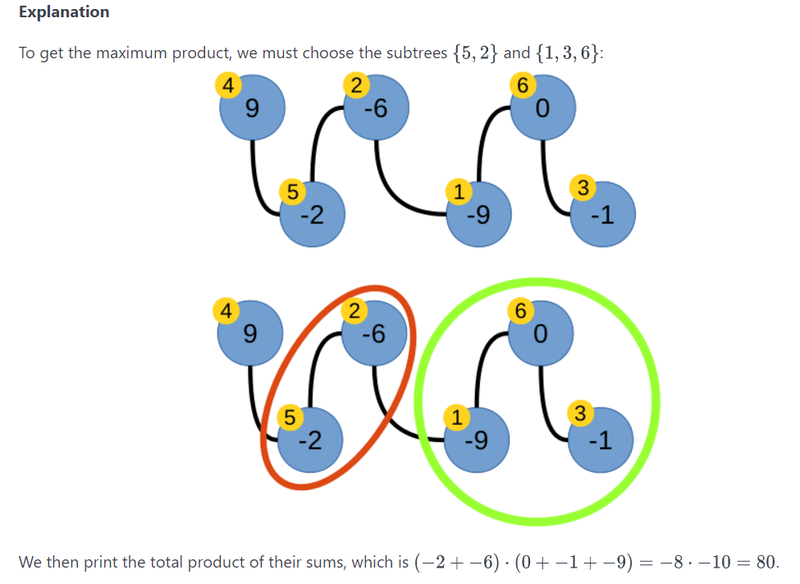 Given the configuration of tree T, find and print the maximum possible product of the sums of two disjoint subtrees in T (i.e., sum(Ta) · sum(Tb). The algorithm is the hard level algorithm in hackerrank world codesprint 10 in April 2017. I did write a recursive depth first search tree algorithm in the contest, passed the sample test cases but failed all other test cases with wrong answer errors. So I spent hours to study one of code submissions and put together a C# solution after the contest. The algorithm turned out to me a simple depth first search(DFS) after hours study, debugging and walked through the sample test case. My understanding of DFS solution here is that the base case in the sample test case shown in the graph is the node with one connected edge, for example, starting from left to right, node 4 with weight 9 and node 3 with weight -1. For any edge in the graph, for example, edge 1:6 1, node 6 starts a DFS search until it reaches node 4 whereas node 3 starts a DFS search ended at itself. The dynamic programming part is not easy to come out and it takes some time to build the recurrence formula. Base case is easy to figure out, node with one connected edges. For any edge to serve each of two nodes, it has to calculate the maximum/ minimum value include/ exclude itself within all connected edges. The C# code passes all test cases. Depth first search is my favorite algorithm, sometimes I forgot that recursive function is the economical choice for DFS compared to iterative one using stack. //as well to accommodate two nodes in the edge. /// How to define connected edges for each node? /// Id 1 and Id 2. /// uses negative edge id. /// are used for edge id. /// how to understand the max tree for the edge? /// Take the sample test case, and understand it. /// It is a DFS search, for each edge, try to find max/ min value. ///  which only has one connected edge. /// which is the base case. // base case - node with one connected edge. /// its weight to sum all the nodes's weight. I like to answer my own question after 12 months. My review is to work on a simple algorithm first, at least a medium level to help understand the dynamic programming solution before asking code review. Try to understand the algorithm and how to solve it using dynamic programming solution with time complexity O(N) first. The best way to do it is to work on the problem "Find maximum two disjoint subarray product of sum" first, fully understand the design of dynamic programming solution first using the array's problem. I spent a few hours to think about the algorithm on May 30, 2018 and then I tried to isolate dynamic programming algorithm. The problem "Find maximum two disjoint subarray product of sum" is very close to Leetcode 152 Maximum product subarray. I wrote partial solution and the link is here. After that, the rest problem is to work on how to solve a depth first search algorithm on a tree. The whole algorithm should not be hard to solve anymore. Not the answer you're looking for? Browse other questions tagged c# tree graph dynamic-programming depth-first-search or ask your own question.